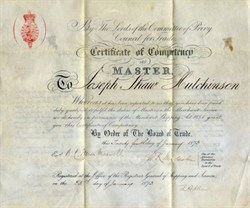 Beautiful certificate awarding to Joseph Shaw Hutchinson the Master in the Merchant Service issued in 1873. This historic document has an ornate writing with a vignette of the Board of Trade's Seal. This item has the original signatures of the organization's officers and is over 140 years old.